Eating and speaking are two activities we do everyday without thinking. These functions are made possible by the temporomandibular joint of your jaw. 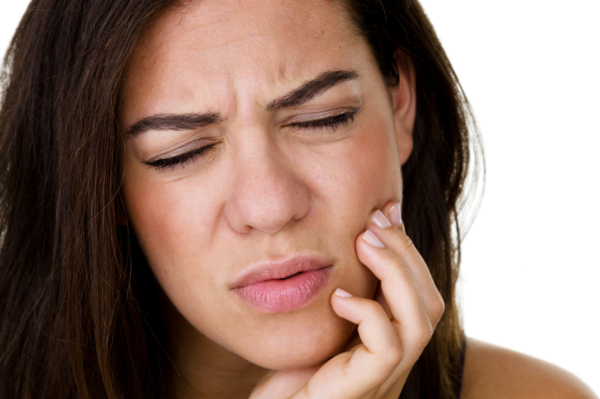 Most pain in the jaw is referred to as TMJ jaw disorder. The pain can vary from uncomfortable to excruciating and almost always hinders daily functions such as eating and speaking. You have a temporomandibular joint on either side of your head just before your ear. It is the joint that attaches the mandible or lower part of the jaw to the temporal bone. This sliding joint makes it possible for you to open and close your mouth and to move your jaw side to side. The following symptoms could be an indication of TMJ. If you start to experience any of the symptoms below, it’s important to see your dentist. Unfortunately, scientists have yet to pinpoint the exact cause of TMJ jaw. Research suggests that the condition is more prevalent among women between the ages of 20 and 40. Some researchers have postulated that because it is more common in women it may have something to do with female hormones. Other studies have shown that physical stress on the joint and surrounding areas can be a major factor in the development of the disorder. In some cases, TMJ jaw can become chronic. Additional conditions such as osteoarthritis, rheumatoid arthritis, teeth grinding, and bone disease can contribute to chronic TMJ jaw. Once chronic, the muscles surrounding the joint can be afflicted as well. There are several courses of treatment for TMJ Jaw, and your dentist will help you determine the best course of action.